When it comes to hobbies, cooking is my #1, but good movies are right up there as well. I follow the Oscars intently every year. I never miss the nominations announcement, where the inevitable surprises and snubs are revealed. I like to predict the winners (lately in a betting pool that includes only me and my husband). And of course, I watch the Academy Awards, which will air this year Sunday, March 2 on ABC. And like last year, I'm creating cocktails to celebrate this year's slate of Best Picture nominees. It's a great crop of movies, stronger even than last year I think. If there's a theme that runs through most of these pictures this year, it's separation: Solomon Northup from his family and his freedom in 12 Years a Slave, Philomena Lee from her long-lost son in Philomena, Richard Phillips from his crew during his abduction in Captain Phillips, and Ryan Stone from anything earthly in Gravity. 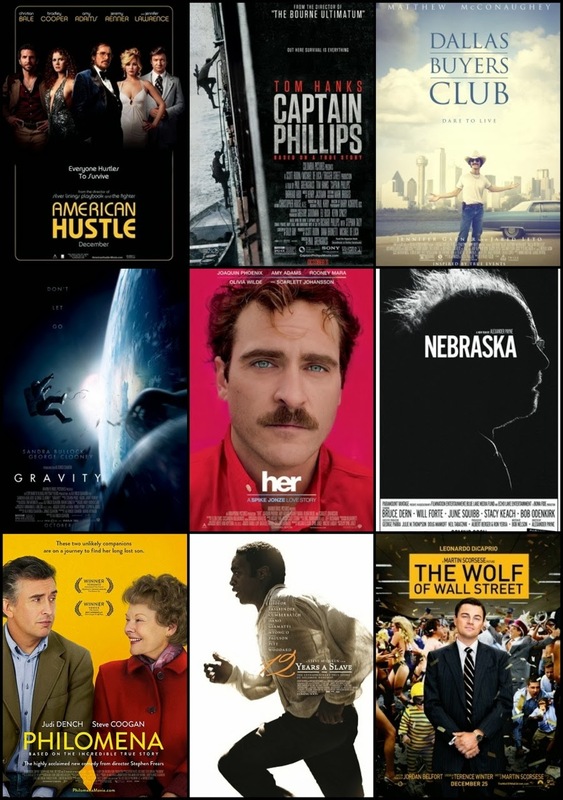 A secondary theme I'd call the big hoax or swindle also runs through several films, notably American Hustle, Nebraska, The Wolf of Wall Street and also 12 Years a Slave. Then there's Her which, although it seems like it could be a film about isolation, or even a hoax, actually has a lot to say about human connection. As I post the drinks in the next few weeks, I'll update this page with links to them. Just like last year's line-up, they range in complexity and style, including a beer cocktail and a dessert cocktail. Several are riffs on popular drinks while others are wholly new inventions. No complicated equipment is needed to make them, but there is an interesting homemade syrup and a vodka infusion. There will also be a bonus cocktail for a film that isn't a Best Picture nominee but is up for several other awards. Dallas Buyers Club: Barrel-aged gin & tonic inspired by Ron Woodruff's quest for treatments to support better health and longer life. Philomena: Cold dessert cocktail inspired by Irish coffee and the film's Ireland and U.S. connections. (Bonus) Blue Jasmine: Jasmine tea-infused vodka martini with blue curaçao inspired by the film's title and Jasmine's love for Stoli martinis. Want just the recipes for reference? They're all here in one post. You've put a lot of thought into this year's Oscar cocktails. Your readers are in for a treat! Thanks! I hope they enjoy them. And thank you for helping me test all of them. I love these! I am also making themed-cocktails for an Oscar Party I'm hosting, and your list is incredibly inventive and inspiring! I think for "Philomena" I am creating a "Buck's Fizz" from the scene on the airplane when she turns down the drink until Martin Sixsmith tells her it's free. She then changes her mind, telling Sixsmith, "You have to pay for everything on RyanAir!" Thanks for the great recipes! Thanks Laura. That's a great idea for Philomena. My version is a dessert cocktail that's geographically inspired. It will be up on Monday. Good luck with your party.